I am not a health food nut. But I love sprouts. On a sandwich, the crunchiness and punch of fresh sprouts is better than any lettuce in my book. Yet sprouts are expensive. I can pay almost $5.00 for a 2 ounce container of sprouts in the grocery store, only to have them go bad within a few days. Or I can make the 20 mile one way trip to the farmer’s market, which has very limited hours, but still pay $3.00 for a box. 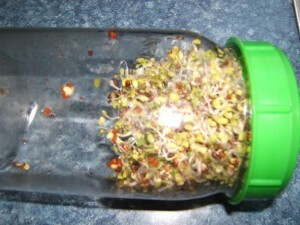 Or for just pennies, I can grow a quart of organic sprouts in my kitchen, guaranteeing freshness and availability. 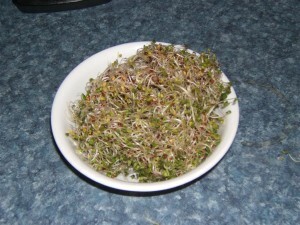 Growing sprouts is a very simple process, and frugal as well. A quart of sprouts costs me pennies, and lasts for a while if refrigerated properly. 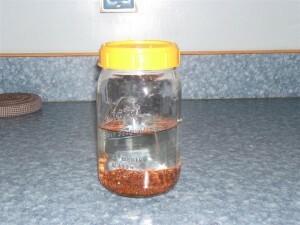 You will need a quart sized glass jar (canning jars work well), sprout seeds, and a secured covering for the jar that will allow water to drain out. Cheesecloth will work well for this, or you can buy commercial covers that fit canning jars, as seen here. 2. 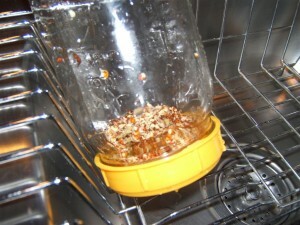 Soak your seeds overnight. For this article, I sprouted organic broccoli sprouts. I put about two tablespoons of seeds in the jar, rinsed and drained the water out, then filled the jar to cover the seeds and let it sit overnight. 3. Rinse and drain your seeds at least twice daily. In the morning, drain off the soak water, then rinse the seeds in warmish water (so it still feels cool on your skin, but not cold), shaking the jar gently to get the water over all the sprouts. Turn the jar upside down and let it sit to drain the water off. 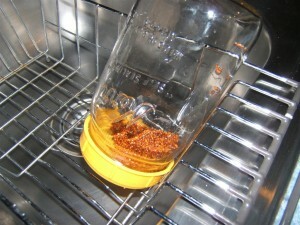 I leave my jar in my dish drainer so that the jar will drain right into the sink. Continue rinsing and draining until your sprouts are ready to go. Day 1 you will start to see some shoots. Day 2 most of the seeds will be sprouted. Day 5, ready to harvest. Sprouts keep best when refrigerated. I keep them in a zipper bag with a bit of towel in it to absorb moisture. The sprouts are crunchy and fresh well up to a week after “harvest”. I’m not sure how long they would last in days, as ours are always eaten within a week. Laura Earnest is a working mom who blogs at SimpleProductivityBlog and Laura Earnest: Solutions for Working Moms. She finds herself becoming more frugal as an outgrowth of a quest to simplify her life. Thanks for sharing Laura! I’ve always wanted to learn how to grow sprouts, and this post has inspired me to get started. How about you? I tried both of the above links for Laura Earnest but was given a “whoops!” page instead. Is there a mistake with the links that could be corrected as I would like to check out these pages? Thanks! p.s. I grow my own sprouts using a cleaned old grease strainer for the drainage component, place it on a saucer and cover it with a bowl. 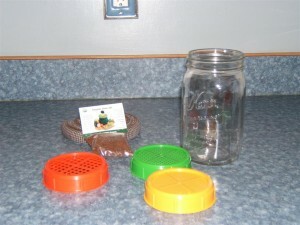 Once the seeds sprout, I remove the bowl, and to green the sprouts, place the sprouts in a clear, covered container near a window. They green up within hours and are more nutritious. mm! Wow! This is great. I didn’t know anything about growing sprouts. This looks like a great and fun project to do with kids also. Thanks for sharing this information. Wow! This is very impressive! And definitely inspirational. I am not too much of a sprout girl but I would love to know how to grow other things on my own! Easy and cheap! Thanks Kelly and Laura! Kristin´s last blog post..Austin Wine Festival 2k9! I fixed the links! Sorry about that, and thanks for letting me know. I remember doing this as a kid and having my dad tease me every night that there was hair in his salad 🙂 I love sprouts and this would be so easy to do — thank you for the post!! I never thought about growing my own sprouts, but if it's that little effort… I don't love sprouts, per se. But I don't mind them in sandwiches. Which I will be eating a lot of in a renewed effort to lose some weight and eat better overall. And if it's that cheap, I'm all for growing them myself! Thanks! Radish sprouts are very yummy on sandwiches! I love sprouts — radish sprouts especially. I have one of those plastic tops and finally found a wide-mouth Mason jar for it, but so far my old method of using a mesh strainer and a Mason jar seems to work better (gets them drier between rinsings since I hang it all in a glass upside down). Will experiment more, though. Also tried cheese cloth, but that kept in waaaay too much moisture and got ICKY! great post, you don't mention where you can get the seeds. I found a local place, West Coast Seeds, but they are never open, i don't want to buy online, i like to go to a place and see what i am buying. Can you tell me where to get them? I actually found my seeds at the local organic food store. They had all sorts of varieties there, including radish, broccoli and bean. .-= LJ´s last blog ..Simplifying Trips: My Travel Checklists =-. thank you so much for this "recipe"!